NPR One: How does content flow in NPR One? Note: Due to the fact that the user can alter the flow, and content is of different lengths estimating exact timing in the NPR flow for any given session is not possible – however we can ensure the platform conforms to general patterns that yields certain results on average. Within the flow there will always be the opportunity for any local content that meets the technical and editorial guidelines to be played. It is possible however for different portions of the flow to have more limiting criteria for content selection (e.g. shorter duration) – but in all such cases, any rules will apply in parity between local and adjacent national content. Station branding and content will be included in the flow on average a minimum of 3 times per 45 minutes of listening. Stations which provide segmented content and newscasts will typically increase the amount an average NPR One listener hears local content or branding to 5+ times per 45 minutes of listening. For editorial guidelines and recommendations, visit nprstations.org. ‘Hello’ messages with local branding are played at the start of a listening session. This is then followed by national newscast and local newscast if available. Currently, as a default, the identifiers are nationally voiced but stations are encouraged to replace it with a locally recorded file uploaded via StationConnect. Local newscast expiration can be set for 2, 4, or 6 hours and be no longer than 10 minutes. Stations can record and create a digital file of their local newscast, place it on our FTP server, and a link to that server will pull it into the app. A link for their newscast is entered in StationConnect. Stations will be notified when sponsorship becomes available. Segmented stories must be less than 12 minutes but ideally less than 4 minutes and no older than 7 days old. 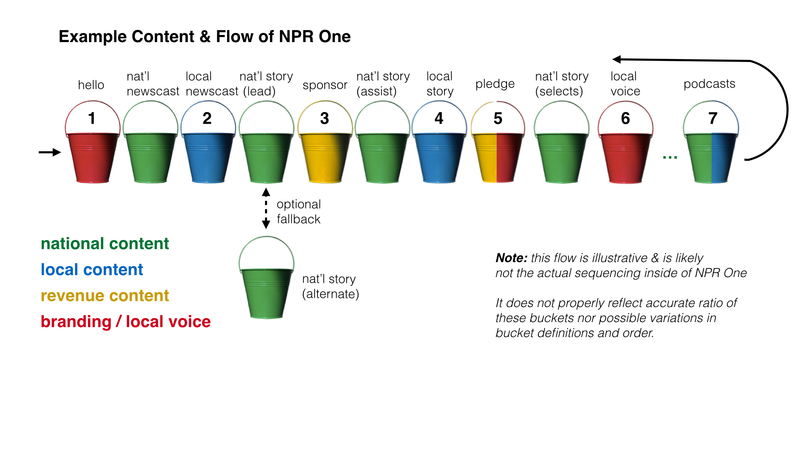 Individually segmented local stories need to be put into the NPR API. Most stations will use CorePublisher to do so. Stations must mark story as available for NPR One by putting it into a proper collection. Stations are encouraged to upload their own locally voiced pledge message. Process and tools are in StationConnect. Donation/Pledge messages will be heard at least once during the first 45 minutes of average listening. Audio messages are a tool can be valuable to both stations and listeners. They can be used to introduce new programs, event promotion, or providing a local connection to their specific station. Stations use StationConnect to upload and manage their messages. Stations can tag their local podcasts in StationConnect. Podcasts (both local/national) will likely only show up in long (>40min) individual listening sessions.